Here at last is an anthology that is not simply a collection of texts, but a carefully crafted tool for teaching and learning. 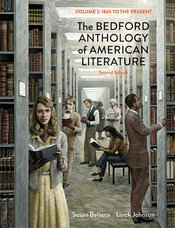 With engaging author and selection introductions and generous gloss notes that supply the meaning of unfamiliar words, The Bedford Anthology of American Literature helps students read, appreciate, and understand American literature. The unsurpassed illustration program helps students grasp the cultural, material, and social conditions in which literary works are produced. Several innovative features supply additional contexts for the literature, while others help students reflect on why American literature is relevant and worth reading today. "The Bedford Anthology of American Literature makes smart choices about what to include and smarter choices about how to organize and interpret that material. It cares deeply about historical context, providing extraordinarily helpful timelines and lucid introductory remarks for each of its selections. More than this, it is beautifully designed and incredibly easy to use. Its inclusion of hundreds of images allows us to bring visual and iconographic literacies to bear on verbal texts—and vice versa."